In 2016, 30 people from important institutions all over the world came together for the first Open Harvest gathering. The goal was to set the stage for a global data infrastructure for agriculture and food. 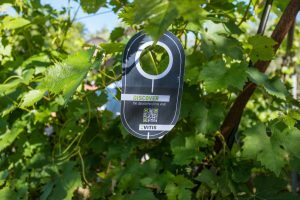 One year later, Agroknow presented the OpenMinTeD application VITIS at Open Harvest 2017. Following the success of the first Open Harvest event in 2016, the bar had already been set high! And Open Harvest 2017 proved to be even better than the first one. You can read more inside details on what exactly happened during the three days of Open Harvest in Crete here. 21 different organizations from France, United Kingdom, Italy, the Netherlands, Canada, United States, China, India, Bulgaria, Greece and Brazil were represented in the Open Data workshop. Participants covered the full spectrum of the agri-food ecosystem, ranging from data scientists and researchers to policy makers and agronomists. Presentations were provided by, among others, representatives from the French National Agronomic Institute (INRA), Wageningen University & Research (WUR), CGIAR, the Chinese Academy of Agricultural Sciences (CAAS), the Indian Statistical Institute, CABI, University of Guelph, and the Global Open Data in Agriculture and Nutrition (GODAN). The outcome of Open Harvest 2017 was that the participants have spoken with one voice through the 2nd Chania Declaration, which was a call to action for all organizations that were present. This declaration is paving the path for addressing grand challenges in the agri-food chain by combining data with technology. Having all these people from all around the world, gathered together and reflecting on the opportunity of data and technology to support research and innovation in the agri-food chain, that was the perfect opportunity to present our use case (AS-A) pilot demonstrator, namely “VITIS”, that is being developed by Agroknow with support from the OpenMinTed Horizon 2020 project. The most important thing was to help participants understand the problems encountered by vine growers in the field and how these problems can be addressed through research and applications, like our use case pilot demonstrator, and how it applies in real life. 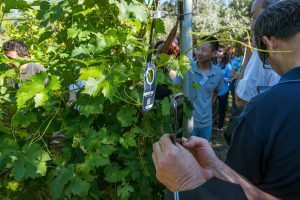 This time, during the hands-on-visit to a traditional vineyard, participants were asked to use their mobile phones and scan the barcodes found on selected vines in the vineyard and see in real time how all the related information on grapevine varieties can be seen directly in front of them. The emphasis was on the discovery and linking of information related to the use and exploitation of viticulture research data, through intuitive visualization of information of the 68 core grapevine varieties cultivated in Greece in various vineyards and through large-scale linguistic pipeline with the possibility for full-text mining over pdf files ingested from different bibliographic databases. Valuable feedback was collected through discussions on the pilot from different perspectives, depending on each participant’s background. This blogpost was provided by OpenMinTeD partner Agroknow.